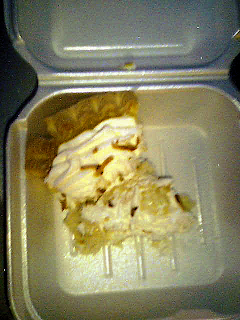 Photo One: Bad cell phone snapshot of a mangled and partial slice of coconut cream pie. This is the piece of pie I was served at a local 24 hour restaurant. No, I didn't drop it. I didn't eat half of it before I took the picture. I theorized aloud (and much later) to my dining companion that possibly the condition of this pie was related to my method of ordering, which involved forming a wedge shape with my hands in lieu of the word "pie" which had temporarily escaped me. She was sure the server was just incompetent and that my lack of speech had nothing to do with it. I remain skeptical. Yes, it's just pie, I know. 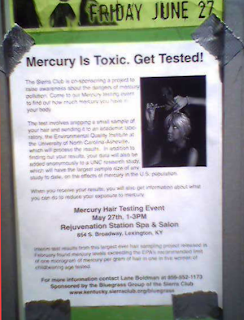 Photo Two: Bad cell phone snapshot of a poster declaring: Mercury is Toxic. Get Tested! Duct taped to a pole. Outside the movie theater downtown, surrounded by flyers advertising music and other entertainment, this poster urges all of us to have our hair tested for mercury. Photo 3 by Andrea of Andrea's Buzzing About. 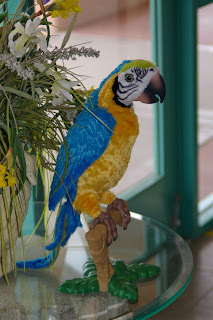 Andrea spotted this Squawkers McCaw lookalike in Arizona. I had to look and make sure Squawkers was still here when I received this one. The resemblance is astounding, and that's not just prosopagnosia talking there. Twins possibly? 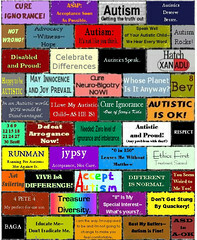 Squawkers has never mentioned a brother or sister, but then his speech is mostly echolalic. Thanks for the smile, Andrea. I needed that. Hmmmm...that pie piece does look pretty bad. If I was served it I would have sent it back for sure. However, then you wonder what they will do to it next? Ugh.